This is a beautiful beach home just 60m from the sea, in a small hamlet called El Calon close to San Juan de Los Terreros. The hamlet of El Calon hugs a romantic horseshoe bay consisting mainly of a sand/shingle beach, but with rock pools at either end; something for sun worshippers as well as somewhere for the kids to explore. A 5 minute drive north takes you to the popular seaside resort of San Juan de los Terreros with its wide variety of bars, shops and restaurants. Approximately the same distance south will bring you to the quaint fishing village of Villaricos which has a busy street market every Sunday throughout the year. A little further south you will discover the excellent Vera water park and the whitewashed village of Mojacar. There are numerous local golf courses, including the world famous Desert Springs Golf Resort and Valle de Este Golf. Go-karting, scuba diving and water sports are also available nearby. Almeria airport is approximately 1 hours drive away, with Murcia San Javier & Alicante airports reachable within a maximum 2 hours drive. The property measuring 99.60m² is very spacious, especially for such close proximity to the sea. As you approach the property you will initially notice the private garage with 30m² of private storage / garage space. A locked gate to the side then allows entrance into the small development of just 4 homes with no community fees at all. A pathway leads around to the property´s front door which is accessed via 5 steps with a private garden opposite that is well-landscaped for low maintenance. As you enter the house you find a hallway leading to a very spacious open plan lounge & kitchen. The kitchen is modern with all appliances and a larder under the stairs. The lounge has a log burning fire, W/C off to the right and a dining area at the rear. This room has ceiling fans and double patio doors out to a large rear terrace with superb sea views. A set of stairs then leads to the first floor with 3 double bedrooms and a family bathroom. The rear bedroom benefits from a small balcony with mountain views whilst all the bedrooms are fitted with ceiling fans. The property is also fitted with mosquito screens. Another set of stairs then leads to a huge roof solarium with fantastic sea & mountain views and here you will find a built-in BBQ & outdoor kitchen area. This is a fantastic outside space which is well used by the current owners. This property is a must view for those wanting a family beach home of a generous size. 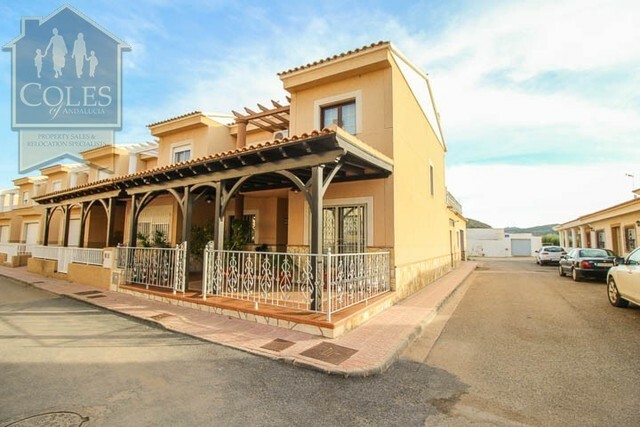 Just 60m from the beach and well located for other villages, beaches and the local water park. The Moorish influence in design is very evident with a large dome on the roof, arches and the wooden pergola over the terrace from the lounge. Full of character! The owners will listen to close offers and viewings are highly recommended.